There are many people who have never been on a camping trip because they are afraid that it takes too much effort. First of all, camping is less stressful than planning a weekend with your in laws or relatives. Camping gives you privacy and freedom that you can never get staying at another person’s home. My good friend recently contacted me and said his family is joining us for their first camping trip in a tent. It’s hard to explain how excited I was to hear this news because we have been discussing this for years. It’s never too late to plan a camping trip. I prepared this first-time camping primer for anyone that has limited or no camping experience. Get some practice before taking that long cross country trip. I suggest camping one week or less for your first time. Recovery from any disaster such a forgetting to pack enough food or waking up cold are easily remedied by a trip to a camping store or Walmart. Most problems are avoided with proper planning and buying quality equipment through a reputable dealer like Back Country or REI. Ask yourself the following questions to determine what camping equipment that you do not have and will have to purchase, rent, or borrow. Write down on a piece of paper all the camping equipment that you own. 1 sleeping bag for each person camping? Do you own or have access to a high-quality camping tent that is easy to put up by one person, will keep you dry, and will set everyone comfortably in your family or group? Possess a good quality and easy to operate dual burner propane canister cooking stove? Sleeping pads or air mattresses that do not leak? Pots and pans that can be used on a 2 burner propane stove? Several LED flashlights and a LED camping lantern? Stackable see through storage bins to keep your food and camping equipment organized? 2 propane canisters or extra fuel for your cook stove? Lighter to ignite your camping stove? Enough clothing to layer to keep you warm on cool mornings? Large cooler for storing your food? BPA free or stainless water jug to store your drinking water in? 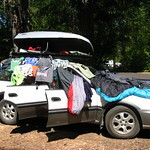 Consider renting or borrowing camping equipment from friends. We buy most of our equipment from REI, Amazon, and Walmart. Whatever camping equipment that you cannot borrow from your friends, buy risk-free from REI. If your camping trip is a disaster…they will cheerfully take all your equipment back and refund your money. Click here to see my comprehensive camping checklist. Most “camping food” is a big waste of money. If you read the ingredients, it’s highly processed, contains beau-coup amounts of sodium, sugar, and preservatives, and it’s expensive. Bring food that you would normally eat at home. Forget unhealthy foods like hot dogs, chips, and junk food unless this is how you roll at home. If you want some convenience foods, pack some canned chicken or salmon that you can buy at Costco or Trader Joe’s. My wife and I make several pounds of healthy home-made organic granola to eat for breakfast. We usually top granola with fresh fruit and yogurt. This is your first camping trip and not a trip to the bushland of Alaska. Whatever food that you forget to bring, I promise that a grocery store or super Walmart is going to be extremely close. We cook all of our meal on a white gas Coleman dual burner stove. First time campers may want to consider using a propane stove as they are much easier to operate. Bring a high quality frying pan and a large kettle to boil water. Planning your first night on the road sets up a good trip. Don’t try to wing it on your first night. I usually plan every day where we are going to stay. If you will be camping in a busy area, make reservations through Recreation.gov to ensure a camping site the first night. 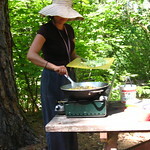 Recreation.gov allows you to reserve campsites at tens of thousands of campgrounds across the US. It’s my practice to never drive more than 4 hours on our first day because contingencies happen. We’ve visited emergency rooms on 2 camping trips for a minor bite and 1 ingrown toenail. Bring lots of maps because you will loose them. 6 years ago, we left our maps at house that we stopped to buy some last minute equipment. I had to find a local AAA to replace them. Maps have flown out our windows, we lost them, ripped them, spilled water on them, etc. You need a campground that has water and toilets. You can always improvise when it comes to bathing. We often fill a basin with hot water and bath manually. My wonderful wife requires the use of a toilet. If you can find a campsite with hot showers, running water, and flushing toilets, you have arrived at camping Nirvana! Oregon State parks have some of the best facilities for camping that I have ever come across. Hot showers, laundry, and flushing toilets are usually available. Some Oregon State parks have Wifi!